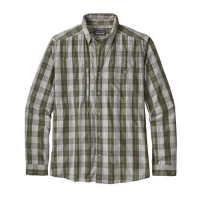 Patagonia Men's Long-Sleeved Pima Cotton Shirt wears soft to the touch. 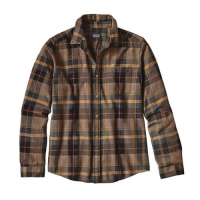 The Patagonia Men's Long-Sleeved Pima Cotton Shirt has two button-through chest pockets. 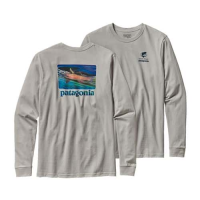 Patagonia Men's Long Sleeved World Trout Slurped Cotton T-Shirt is a great graphic on the back and the Patagonia logo on the front chest. Made of 100% organic cotton, this Trout t-shirt is super comforatable. Patagonia Men's Long Sleeved Bluffside Shirt is a 100% organic cotton plain weaved shirt that can be easily dressed up or dressed down. This slim fitting Bluffside shirt has a shirt tail hem and drop in pocket on the chest. Patagonia Men's Long Sleeved Gallegos Shirt is easy to care for and perfect for travel, this lightweight, breathable, quick-dry, long-sleeved shirt is made with a 53% nylon/47% TENCELA(R) lyocell fabric.